The pace of this movie is set by the opening shot of Stephen Dorff taking his black Ferarri around the track four full laps. Coppola just sits the camera on a tripod and we watch the car whiz by four times before coming to a stop. Such is the way of "Somewhere," a languidly paced but beautiful study of privilged ennui as seen through the eyes of Dorff's burned out actor, Johnny Marco. Scenes that would normally be on screen for only a few seconds are dwelled on for minutes at a time, like the charming routines of the two, blonde pole-dancing stippers that perform for Johnny in his hotel room at the exclusive Chateau Marmont hotel in Los Angeles. 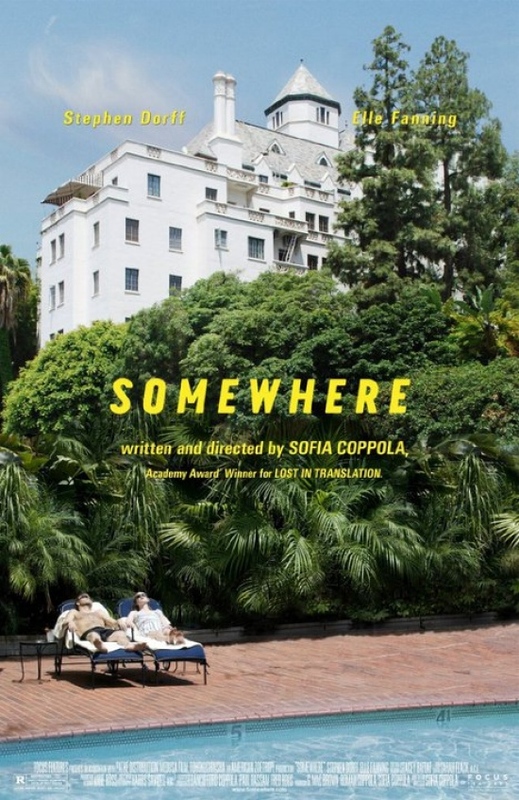 Here's what I came away with from "Somewhere": Sophia Coppola is more concerned with mood and beauty and atmosphere than the details of laying out a structured three act film or tying up loose ends. She captures the essence of places and things by not only taking her time in shooting them, but by studying details that some might consider mundane (airport announcement system, elevator chimes, street signs, etc.) but that somehow manage to capture what we remember most about experiences in such places. Her lighting choices and camera angles are just spot on. As a story, "Somewhere" is weaker than "Lost in Translation." There is probably no more than 30 pages of dialogue in the entire movie. But if you're willing to take your time and just let this movie wash over you, as it's meant to, "Somewhere" is a moving movie going experience. It will linger in your mind after you leave the theater, and any movie that can imprint itself in your mind these days is doing something right.